An evolution of innovative, technologically advanced pizza boxes. 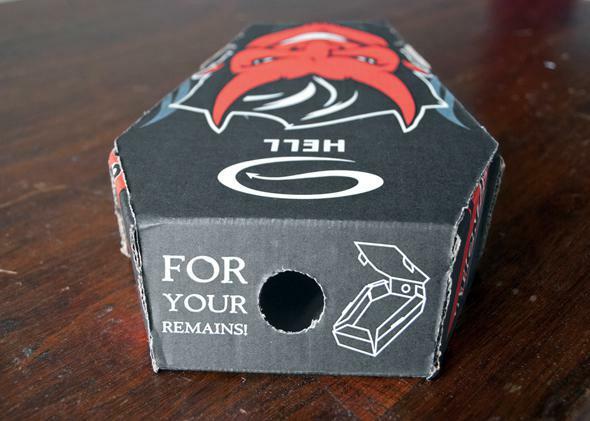 These cutting-edge pizza boxes should be standard-issue. Excerpted from Viva la Pizza! : The Art of the Pizza Box by Scott Wiener, out now from Melville House. 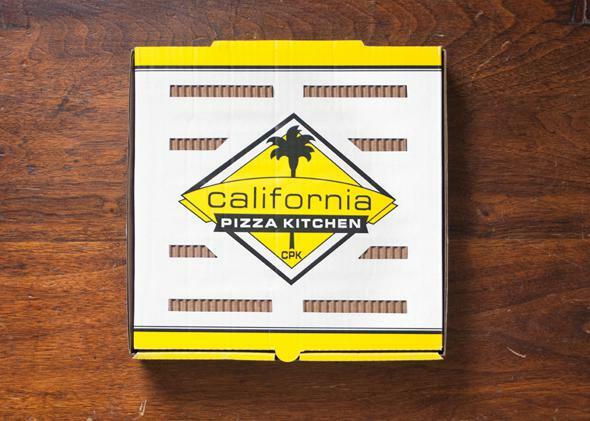 A temperature-resistant molded plastic device is described for use in boxes or packages such as pizza boxes where there is a tendency of large cover portions to sag downwardly to damage the soft pizza or other packaged products. Millions of Package Savers are sold every year for the cost of about 1 cent per piece, but the rising popularity of corrugated Walker-style and corner-cut boxes are leading to its decline. 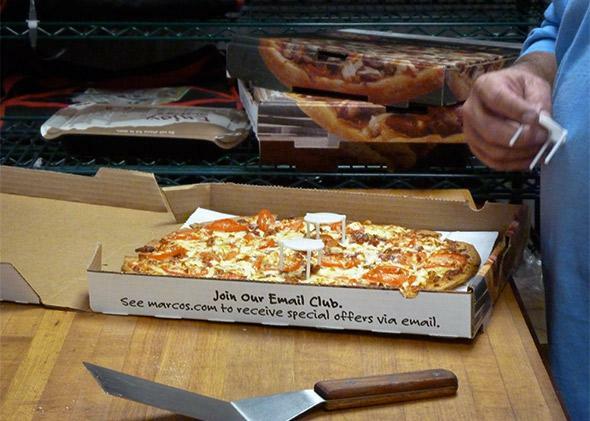 In 2009, Andrew DePascale and Marcello Mandreucci invented a space-saving solution for cluttered pizza-eating situations. 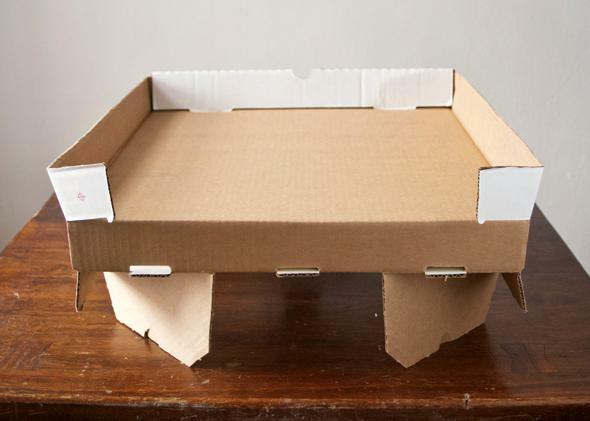 This box transforms into a serving stand to free up table space that would normally be eaten up by the box’s footprint. Perforated regions of the lid fold out to connect with tabs on the side and front flaps, lifting the box base 6 inches off the surface. Since the box is not losing heat by direct conduction, the pizza theoretically stays hotter longer than it would if sitting directly on a table. 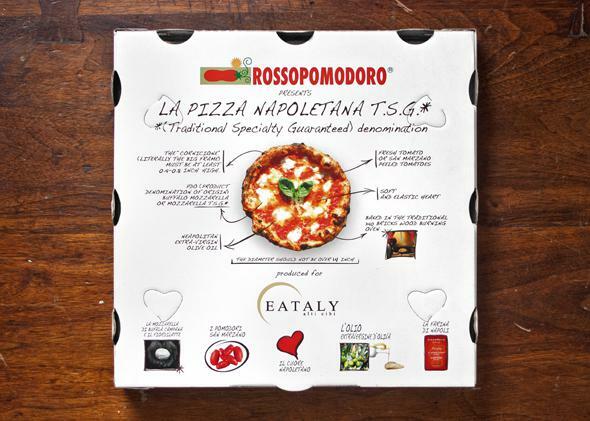 This just may be the most talked-about innovation in pizza box history. A custom dye pattern creates perforations that allow the lid to split into four serving plates, and the base becomes a storage container for leftover slices. Beyond this automatic secondary use, the perforations make it easy to break the box down for disposal once it has exhausted its usefulness. Pizzerias can give customers the benefits of a GreenBox for no additional cost over that of conventional corrugated boxes. 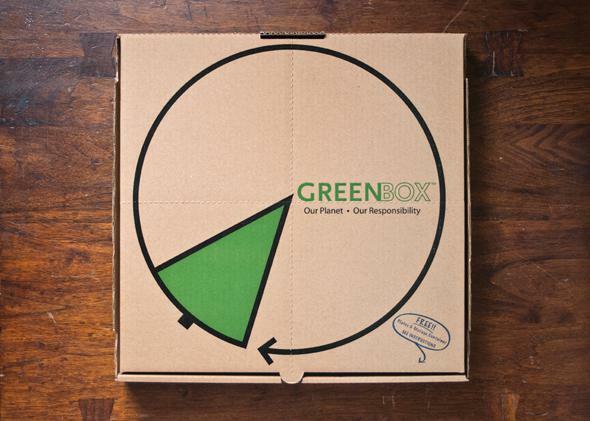 The GreenBox’s stock graphic creates a visual pun with the pizza slice/evergreen tree to stress the “green” theme, but the artwork is completely customizable. This Euro lock box features 17 discrete vents for steam release, four of which double as structural stabilizers. Exciting as that may be, the container’s interior holds its true innovation by way of a metallic polyester lining that both conducts heat and prevents the paper component from absorbing oil. Water-soluble glue bonds the metallic coating to the inner liner, making separation simple for recyclability. Because of its advanced features, this technology runs double the price of a standard corrugated pizza box. The VENTiT Box by Shree Krishna Packaging (India) tackles the Holy Grail of pizza box ventilation: allowing crust-damaging steam to escape without sacrificing necessary heat. The box does so by exposing sections of the corrugated medium in alternating segments inside and outside the box, allowing moisture to escape through the fluted channels of the medium. Manufacturing the box involves a slight rearrangement of traditional corrugated box construction but requires no new technology. 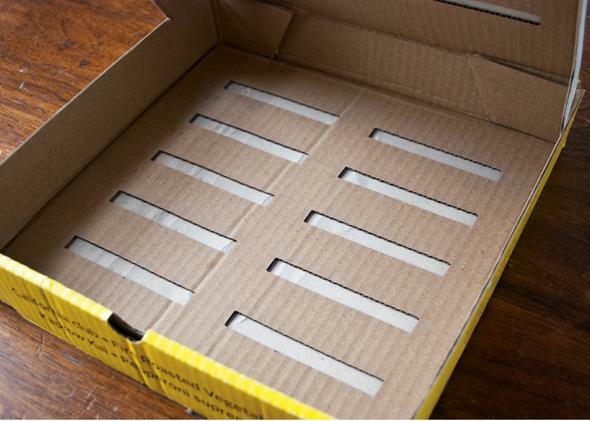 A standard box’s three layers are usually combined, printed, and then cut. The VENTiT method calls for the joining of the medium and inner liner, then cuts the two together before combining it with a precut, preprinted outer liner. Shree Krishna’s owner, Vinay Mehta, said he “was blessed with the idea” after 35 years in the corrugated industry. The invention has since won several design awards, including first place in the Form and Function category at the 2011 Association of Independent Corrugated Converters Awards in Las Vegas. The AICC has not honored any other pizza box before or since. Currently available only in Mumbai and Dubai, VENTiT has the potential to drastically improve the quality of delivery pizza. In 2009, Pizza Huts in Australia and New Zealand began using the “Hot Spot” to ensure hot pizza upon delivery. The small black-dot sticker is printed with leuco dyes, which become transparent when they reach a predetermined temperature (+/–5 degrees Celsius). 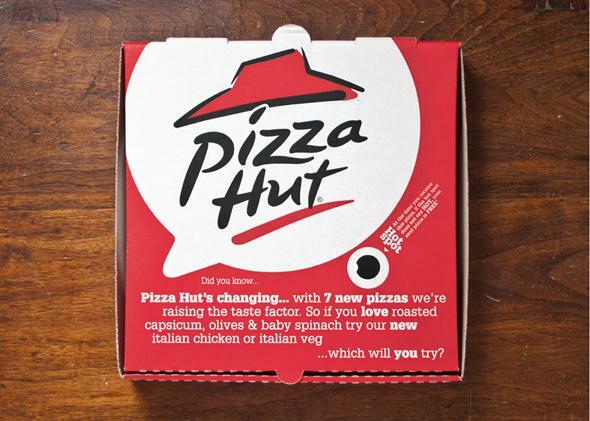 Pizza Hut tuned their dots to disappear at approximately 50 degrees Celsius, or 122 degrees Fahrenheit, revealing the word “HOT” printed with standard ink below. This relatively low temperature outside the box translates to a much higher 68 degrees Celsius, or 155 degrees Fahrenheit, on the inside. 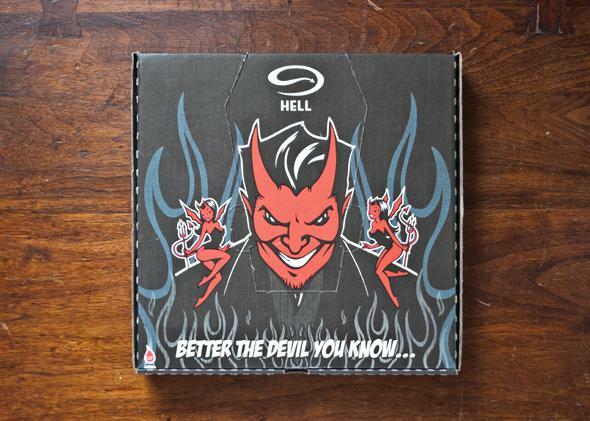 If a customer receives a pizza box that does not show “HOT” on the sticker, she is entitled to a free pizza. This creates an incentive for operators to maintain a high speed of service, because the stores themselves, rather than Pizza Hut corporate, are responsible for paying for the free pizzas. The box has no ventilation beyond the small tab along the lid’s forward edge, so minimal heat is lost due to steam release. Unfortunately, the Hot Spot sticker cannot be placed inside the box and is therefore subject only to temperature fluctuation outside the highly insulated container.